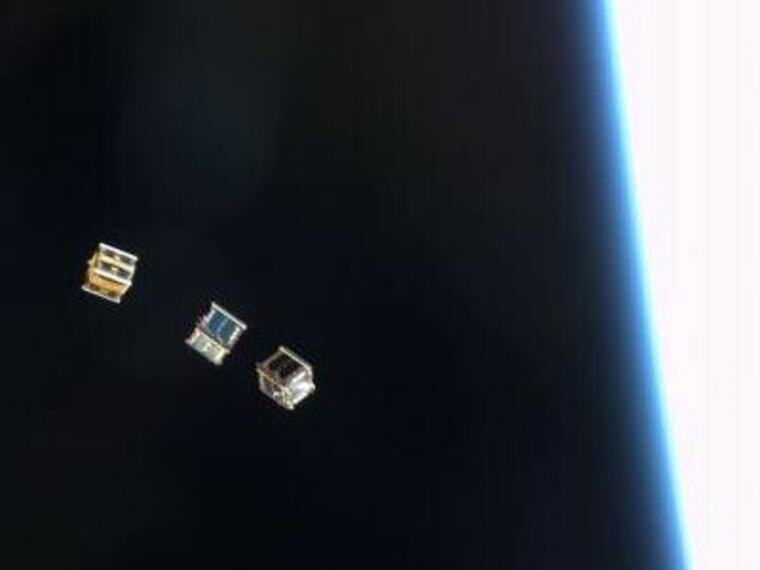 Two tiny satellites supported by Kickstarter campaigns were kicked out into orbit from the International Space Station on Tuesday, beginning what's expected to be a months-long citizen science mission. NanoSatisfi's ArduSat 1 and ArduSat X nanosatellites were deployed by a Japanese-built, spring-loaded launcher attached to the space station. A Vietnamese-built nanosat called PicoDragon was sent out as well. All three satellites were built to CubeSat specifications, 4 inches (10 centimeters) on each side, and delivered to the station in August aboard an unmanned Japanese cargo ship. The ArduSats were funded in part by a Kickstarter crowdfunding effort that raised more than $100,000. NanoSatisfi's venture-capital backers kicked in an additional $1 million-plus to get the project off the ground. Each CubeSat costs on the order of $200,000 to build. Peter Platzer, a former research physicist and Wall Street trader who co-founded NanoSatisfi last year, said he started getting congratulatory emails about the ArduSat deployment from European supporters at 4 a.m. PT (7 a.m. ET). "It is an unbelievable amount of relief and excitement that is going on," he told NBC News. He said it would probably take a few days to get the first pictures and data from the ArduSats. The tiny satellites are designed to acquire readings from 10 even tinier sensors and send them down to ground stations in Europe, California, Texas and Massachusetts. The project's supporters and customers can request pictures of particular places on Earth, or run their own experiments on the satellites. "There are kids as well as citizen scientists," Platzer said. NanoSatisfi had expected the ArduSats to operate for about three months before their orbits decayed so much that they'd burn up in the atmosphere. But Platzer said there may be some bonus time because the satellites were deployed while the space station was in a relatively high 260-mile (420-kilometer) orbit. "Now the adventure truly begins," he said. Could tiny engines send CubeSats to other planets?